'Stairway to Paradise' runs Friday–Sunday through July 1. Jack London State Historic Park, 2400 London Ranch Road, Glen Ellen. Doors open for picnicking at 5pm; show starts 7:30pm. Tickets $45–$150. 877.424.1414. transcendencetheatre.org. 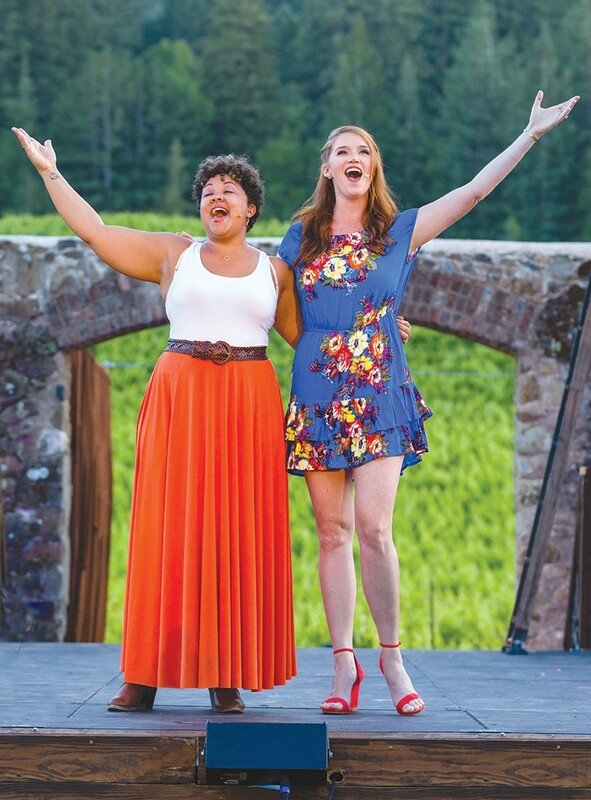 GET HAPPY Shaleah Adkisson, left, and Courtney Markowitz sing a duet made famous by Judy Garland and Barbra Striesand. Transcendence Theatre Company opens its seventh season of Broadway Under the Stars in Jack London State Park with Stairway to Paradise, the first of four staged concert events scheduled this year. The company takes performers with Broadway, touring company, film and television experience and creates an original themed musical revue around them. This year's theme is "Every Moment Counts" and director-choreographer Tony Gonzalez has designed 20-plus production numbers full of memorable moments. The Transcendence playlist includes Broadway show tunes, a mix of recent and past pop hits, classic rock and specialty numbers. They're all done in Broadway-style, occasionally with a twist. It often works, but sometimes it doesn't. The first act runs the gamut from numbers from South Pacific, The Wiz, and Victor/Victoria to "Me and Julio Down by the Schoolyard" and "The 59th Street Bridge Song (Feelin' Groovy)" by Paul Simon. Highlights include a recreation of the famous Judy Garland/Barbra Streisand duet of "Get Happy/Happy Days Are Here Again" with Courtney Markowitz and Shaleah Adkisson, and Christine Lavin's popular "Air Conditioner" song, also done by Adkisson with Tim Roller. The act ends on a local note with a performance of "Everything," a tribute song written by songwriters Mark Beynon and Joe Label, and the Transcendence version of "Oklahoma," which morphs the Rodgers and Hammerstein classic into "Oh, Sonoma!" The second act includes numbers from Cabaret, Into the Woods and The Sound of Music mixed with Justin Timberlake, Van Halen and, in the evening's one clear misstep, Don McLean's "American Pie." Sorry guys, but perky, Cheshire cat–like grinning performers singing "This'll be the day that I die" just doesn't work for me. It's a little creepy. Things snap back with a jaunty Michael Linden performing Drew Gasparini's "A Little Bit" and large-scale numbers with Timberlake's "Can't Stop the Feeling" and Van Halen's "Right Now" before concluding with "Finale B" from Rent.